This page is for the first DanceDanceRevolution game, released in 1998. For the 2010 Wii/PS3/Xbox 360 game, please see DanceDanceRevolution (2010). 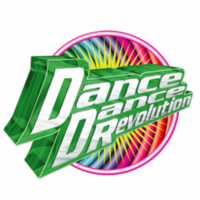 For the 2013 arcade game of the same title, please see DanceDanceRevolution (2013). For the song of the same title, please see Dance Dance Revolution (song). DanceDanceRevolution is also known as "version 1.0", and the Internet Ranking Version as "version 1.5". In the later games, the version folder for DanceDanceRevolution is called DDR 1st. DanceDanceRevolution has the first introduction video of the series during the opening credits. The game features promotional materials related to the Dancemania series during the opening credits. This would continue to be the case for several versions after that. The game features an announcer which was used until DanceDanceRevolution 5thMIX. The music selection screen is a jukebox-like menu with 6 CD covers, each representing a song available to play. Three play style options are available: Single, Double and Couple. Double requires a step code to activate. Three play modes are available: Easy, Normal and Hard. Easy mode allows the player to play 1 song completely even if the LIFE GAUGE is depleted. Same music selection as Normal. The game songlist is divided into two parts: Normal mode and Hard mode. A few songs can be found in both modes. Only two dance levels can be selected: BASIC and ANOTHER (DIFFICULT). MANIAC (EXPERT) was added with the Internet Ranking Version. The difficulty is selected at the same time as the play mode. It can only be changed using step codes after that. Only one modifier was available: the TURN option MIRROR, which required a step code to be entered on the dance stage. The default and only arrow color was FLAT. AFRO, LADY, KONSENTO:01 (コンセント1号) and OSHARE-ZUKIN (おしゃれずきん) are selectable characters. By default, AFRO is player 1 and LADY is player 2. During gameplay, the selected character appears on screen dancing in front of animations. Each song have a set of predetermined short animation videos synced to it. However, some of the videos are shared between the songs. To identify the choreography used by the dancer, the game shows on screen the type of dance currently in use: hip-hop, jazz, house and Capoeira. Showing the dance type is a feature only found in DanceDanceRevolution 1st. The possible rank result for a song are S, A, B, C, D.
First game in the series to have an EXTRA STAGE system. This system would not return until DDRMAX's release. The Internet Ranking Version update is the most common version, and includes two new songs and some interface updates. Versus play was added and it requires a code to activate. Single MANIAC and Double ANOTHER charts were added. The foot level names were changed, they stayed the same (with the addition of foot level 9 CATASTROPHIC) through 3rdMIX PLUS. EXORBITANT was added as feet level 8 and the feet levels 2, 3, 4, 5, 7 were changed to MODERATE, ORDINARY, SUPERIOR, MARVELOUS, PARAMOUNT respectively. The score is now displayed in red instead of blue. Successfully hit arrows disappear and display a flash on the receptors. The original release made no visual distinction between hit and missed arrows. As the name suggests, Internet Ranking codes are displayed after the game. After submitting the score to the official website, the player score will be able to compete for high scores online. The original release used the 1986-1998 KONAMI logo in-game (one of only five Japanese BEMANI games to use it, the other four being the first two beatmania arcade games, the original PlayStation beatmania home port, and pop'n music). Internet Ranking Version uses the 1998-2003 KONAMI logo. It uses the 2ndMIX game interface. Several of the licenses were absent. Instead, a selection of the KONAMI originals from 2ndMIX were included. The North American version of DanceDanceRevolution is based on the Asian version, but it replaces STRICTLY BUSINESS with BOOM BOOM DOLLAR. Full credits list: DanceDanceRevolution credits. Songs with a bolded chart (mostly Single MANIAC and Double ANOTHER) were added in DanceDanceRevolution Internet Ranking Version. The Couple difficulty (not included) is the same as the Single difficulty. The EXTRA STAGE system gives access to one free song on the next dance level difficulty than the currently selected one by the player if it exists. In the original DanceDanceRevolution, it's only possible to have an EXTRA STAGE by playing BASIC Single Play which give access to one song on ANOTHER. The other condition is to clear any song on the FINAL STAGE with a full-gauge to get either MY FIRE to appear when playing NORMAL or PARANOiA on HARD mode. In the Internet Ranking Version, this was expanded to also include ANOTHER Single Play granting a song on MANIAC and BASIC Double Play giving a song on ANOTHER to play. The other condition is to clear a song on the FINAL STAGE with a full-gauge to either get TRIP MACHINE to appear when playing NORMAL mode or TRIP MACHINE or PARANOiA on HARD mode. KONSENTO:01 (コンセント1号), OSHARE-ZUKIN (おしゃれずきん): Hold down the Left button when the game start or press the ← foot panel when pressing the Start button. DISC-A & DISC-B (輪っか): Hold down the Right button when the game start or press the → foot panel when pressing the Start button. VERSUS: After inserting 2 coins, press and hold both the Left and Right arrow and then press Start. DOUBLE: On the Music Screen, press ↑↑↓↓←→←→ on the foot panels and then Enter. ANOTHER: On Music Screen, press ↑↑↓↓↑↑↓↓ on the foot panels and then Enter. MANIAC: On Music Screen, press ←←→→←←→→ on the foot panels and then Enter. MIRROR: On Music Screen, press ←→←→←→←→ on the foot panels and then Enter.